Oh, this outfit? I just threw it on. After a long semester and a winter that seemingly went on forever, summer is finally in full swing. A few weeks ago, we showed you some lazy girl outfits for summer that were minimal in effort but still had maximum style. Now we’re back with part 2! 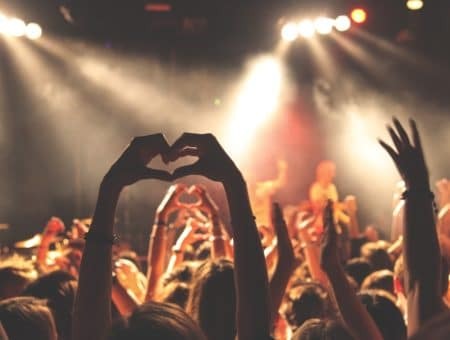 Whether you’ve been enjoying the warm weather at the beach or chilling inside with your air conditioner on blast watching Netflix, here are three more non-basic outfits to try this summer. Embrace your inner lazy girl! If there’s anyone who (supposedly) embodies effortless style, it’s fashion’s idea of the French girl. Quintessential “french girl” style is all about non-basic outfits that are – gasp – actually made up of basics. For our first of our lazy girl outfits, we paired a stereotypical but classic striped shirt with retro sunnies and low-heeled mules. 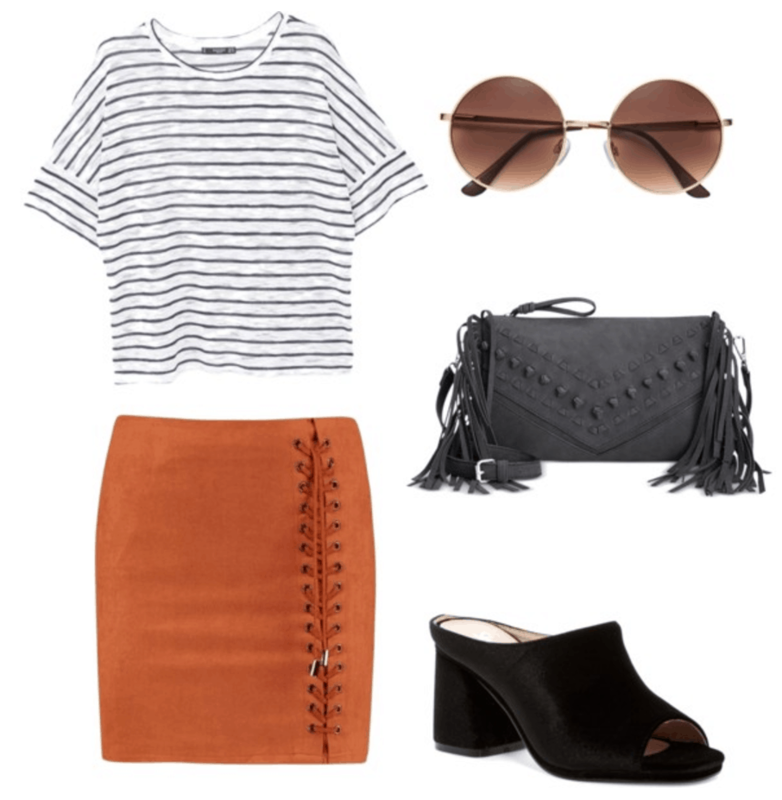 By adding a fringe crossbody bag and a faux-suede skirt (which comes in sizes from petite to plus! ), we give the outfit a boho, summery vibe. Last week on CF, we showed you examples of how to wear wide-leg jumpsuits, and for today’s non-basic outfits post, we’re showing you another way. The jumpsuit is already a one-piece wonder – you throw it on and go. But the bright yellow helps you really stand out in a crowd. White Vans make it more casual, while peachy colored details – like this literal peach-shaped purse and a MAC sheer lipstick in Coral Bliss help accentuate your summer glow. 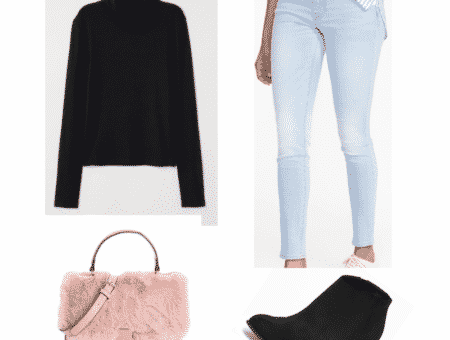 The easiest lazy girl outfits revolve around mixing and matching within the same color family. So if you’re the type of person who loves wearing dark colors, why not do so in the summer? 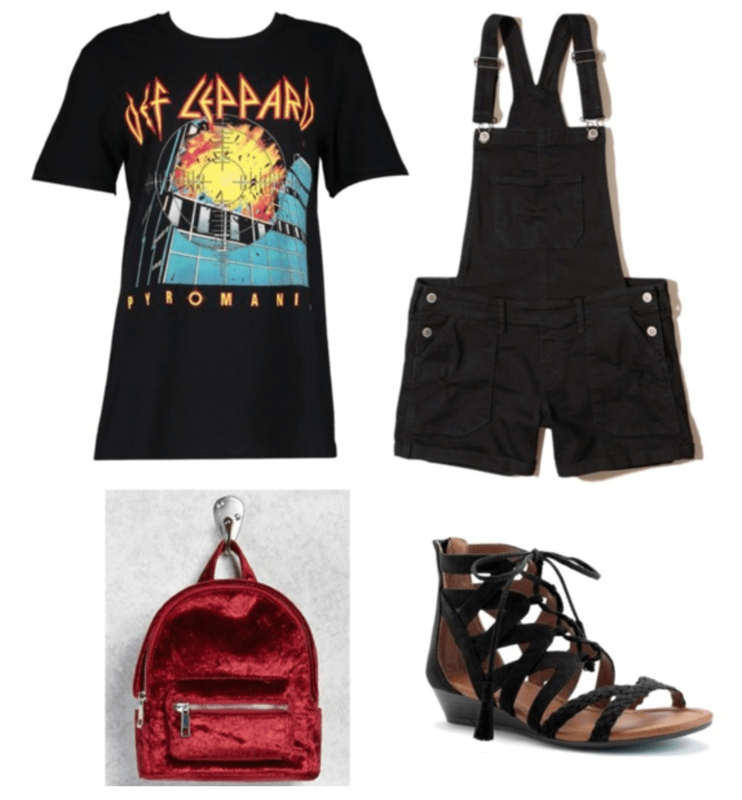 For the final non-basic outfit, pair your favorite dark-colored band tee with black overalls for something easy that still makes a statement. Black wedge sandals give you some added height. And even though summer is usually about lighter, more airy fabrics like lace and chiffon, accessorizing with red velvet adds some unexpected flair to your outfit. Are you a fan of any of these looks? Would you dare to try them? Let me know in the comments!